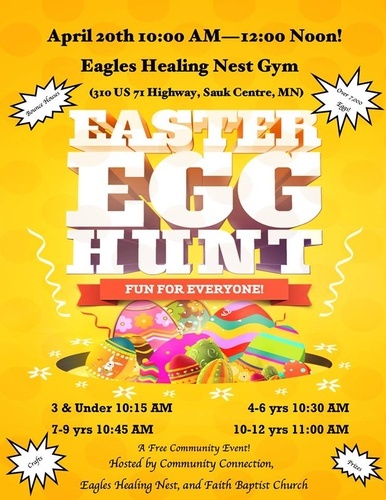 Sauk Centre Community Egg Hunt is set for April 20th, 2019 at the Eagles Healing Nest Gym! This is the 3rd year that Community Connection, Eagles Healing Nest, and Faith will host this event! Last year, we had over 20 corporate sponsors come on board and support this family friendly event! We look forward to hiding over 7000 or more eggs this year. We will also have prizes and money packed grand prize eggs! As always crafts, food, bounce houses, Easter Bunny and a new friend, and other events as well! Join us for a Saturday of fun for the whole family!